Paul: Today involved working on updating the database using web based EDGE, this task involved transferring customer information from spreadsheets. This also required me to use filters and tracking work done using different colours in the spreadsheet. It was important to be organised for this task and also to be able to make the data as easy to read as possible, so a good understanding of the data and also formatting was key to completing this task effectively. This new database is shared with other hospitals to help track different trials. Today I also had the job of typing up some invoices into an excel spreadsheet and I also planned out some marketing techniques for products. My working environment here in Devon is very good. Every one is very friendly and Ian Armstrong my manager is very helpful and is trying to do things that are most beneficial to me so I come out with as much experience as possible. Paul: On Sunday we decided to explore of what Devon has to offer in terms of history and heritage. We decided to visit the Heritage steam train and took a trip on the steam train from Paignton to Kingswear. This train was built in the 1950, but fell into disrepair, before being restored by the Dart Valley Railway in 1973. In has featured in the series Poirot which made the experience even more interesting. Overall it was such an interesting experience and great to see another side to Devon. 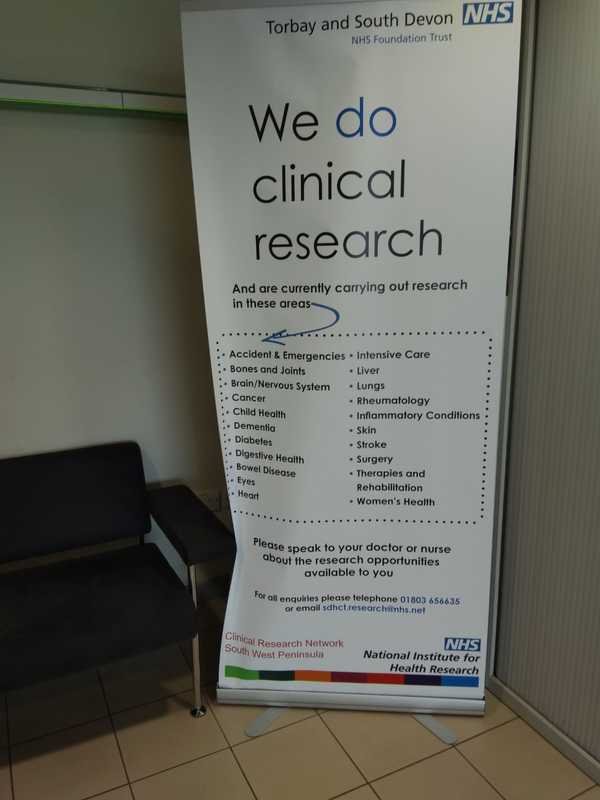 Monday 21st was international research day, part of today's work involved help setup a demo in the main entrance of the hospital. This displayed areas of research for heart, arthritis and other organ research. The remainder of the day involved EDGE database updates. Today I went into the hospital where I was shown how to order and keep stock in all store rooms available so that staff will not run out of things they need, I was then told more about the new system that they are putting into place and was asked to help create new bar codes for different products taking into account what factory they came from etc I had to print the name product code and barcode onto stickers using a machine using the information we had gathered when going around in the morning scanning the old codes while keeping things stocked which even the staff found difficult and told me of all the problems they are facing adapting to the new system they told me it will take until 2020 to get the whole thing done. David: Today I was back working in the office where the spreadsheet I worked on yesterday was checked and sent on to the workers in the warehouse. After this, we went back over to the hospital where I was shown where I would be based tomorrow and I also got a tour of all the stock rooms in every department of the hospital. It was so fascinating to see that there was no way to record individual units such as needles and other devices when they were taken from each location. I was then told about the new system that the NHS are developing called the GS1, and that I will be learning more about it next week which will require me to design barcodes etc. so that all devices can be recorded when they leave the stock room, which sounds very interesting. Tomorrow I am meeting with Peter, who is going to bring me around and show me how the ordering process of booking is done. Overall today was a very eventful day and I am looking forward to what tomorrow has to offer. Paul: Today my work at Horizon House involved updating the databases, comparing records from the older system to a newer system, and also updating new patients records. This involved using spreadsheets with filters turned on. The planned workload is to update approximately 150 databases, to update all the required fields. The main exercise is the record and tabulate any differences between them. Approximately 20 databases are completed daily. As part of today's work, I was instructed to do a skills test for a level 2 admin position as a test subject. It was very good to know what is required for such a position and it was great to be able to partake in such an activity. The work that I complete each day is interesting to me and the work is also varied which keeps my days interesting. One thing that we have found to be very convenient is that the bus tickets that you buy cover you for the week, which is great. Kevin: Today I created a waste sheet method for the hospital to use on their new project. I did one for the employees and one that factors in all the costs for the business aspect. I started the waste sheet myself and all the data is my own. The waste sheet contained formulas and filters and it has been great to put into practice some of the skills that I have learned during my time in college. I'm also very familiar with their suppliers and how they search for products. This project is proving to be very interesting. Danielle: Today I left the lodge and got the 7:55am bus to the harbour where I got off and walked up through the town to work. At 9:10am one of the women who works in Amin, took me to do the post run. This required us to record using a spreadsheet, all the medical items taken in and out of the office and filing. I was shown where the room was with the filing cabinets, so we sorted out the post and brought it to the post trays for the people to collect. I then went and did the Paris training which took another 1 1/2 hrs. Afterwards I waited to get my password to log in to start working on this task. So while I waited I did scanning which got sent to my supervisor where I was required to rename all the documents which over all took 4 hours. Today I finished at 4pm but I didn't get the training finished as it takes 2 hours and I only had 1 hour to do it, so I will be hopefully finished it tomorrow. Overall today was a busy but eventful day. Paul: Today my day began at 9am. My team leader demonstrated to me the different stages of my placement. This required 1 hour of training, followed by a demonstration. After this, I completed the data inputting and checking for Edge database. This involved entering data for many projects. This will be mainly my workload for the remainder of placement. As part of experience today I meet others groups in clinical trials, which proved to be very interesting, where the use and knowledge of spreadsheets is essential, and many formulae are used in the process. Overall I feel as though I am gaining in confidence as the days progress. Within the work environment here, good teamwork, respect and clear communication are some of the skills that are expected of all staff. Danielle: This morning we left the lodge at 7:35am, it was raining so we ordered a taxi which dropped us to the bus station, where we got the no.12 bus to work. I got off at the pier in Torquay and walked up through the town to Union House for a 9am start. At 9.30am I went to Customer Services to see what it was like to work there, and also to learn what they do. I was with one of the staff member who was taking calls from clients and service users' members of family. I was listening to the calls through the phone while she was on the hands free set. She was putting them through to other departments to deal with the callers. This was a very good experience as the calls dealt with different issues and most of them were very serious and important calls regarding illness and older peoples issues. After this I went back to administration and I tried to login to the hive which is the name of the internet system here. Unfortunately my login wouldn’t work so I had to ring the customer help desk to try and sort it out. I eventually got it to work after ringing customer services. Today I also completed the data security aware course online. It was very good to do this training as I am now very aware of the importance of privacy and safeguarding of the information that is kept secure in environments such as Union House. I then did the Paris training course which was 4 1/2 hrs and I still don’t have it finished so I will be doing it again tomorrow. It took a lot of concentration as there is a lot of information to cover after watching the videos. I had to take tests based on the videos and information on the pages. Overall it was a good day and I was happy to be able to learn new skills and to up skill with the courses that I have completed. Kevin: Today I started work at 9am and finished at 5pm. I was given my own computer and login details today so that I could perform some of the tasks required of me. My first task was to input information about packaging items that the hospital are thinking of getting in, to a spreadsheet and then I had to record some quotes from companies that the hospital received from their suppliers. When I had this done I got to work on a new project where the restaurant are going to operate in a "subway style" system, serving fresh food. I was given the task to come up with a waste management system for them to use to record how much is being wasted and how much money they are losing. This was so interesting and I really enjoying the day and the placement so far. I really like the work that I am doing here. David: Today I was in the procurement office across from the hospital where I would only be for one day. 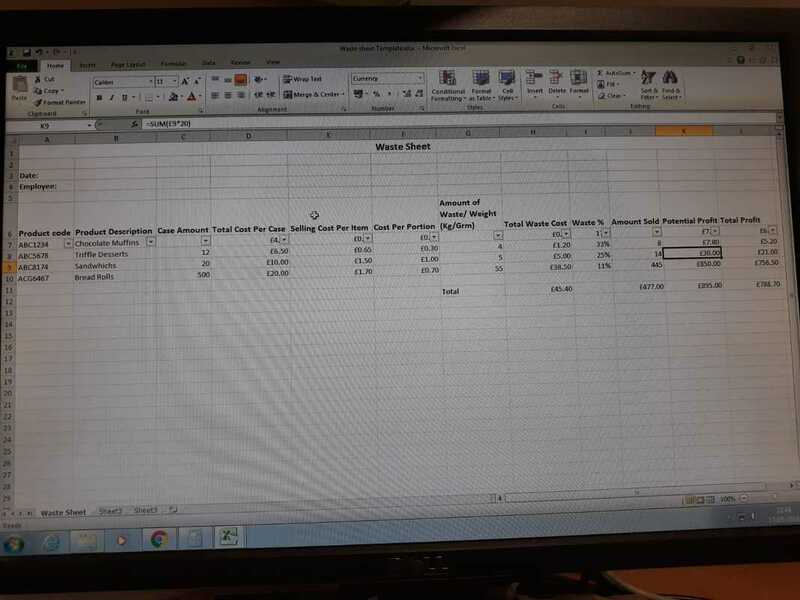 I was working on a spread sheet calculating the risk of not having certain goods and equipment on site at the hospital and creating other sheets to record certain data. Tomorrow I am going back to the warehouse across from the hospital where I will be starting my final task for the rest of the week which is something that I am looking forward to. David: Today was our first day of our placement after we had been introduced to mentors and plan for the two weeks yesterday. Today I went to the hospital with everyone else to find that I will be based beside the college. I was lucky to get a lift from a member of staff, from stock control to the warehouse where I met the three women I would be working with and also the men who work in the warehouse. It gave me a major insight of how the hospital stored all their medical devices, surgery equipment and the difficulties they face when trying to track and transport each individual item. Myself and the other women made a plan and created a spreadsheet on what I would be doing for the rest of the week and I have planned to meet one of them at the hospital tomorrow morning at 9am which I am looking forward to. Paul: Today was my first full work experience day at Horizon House. This involved a meet and greet with the team, which consisted of two project leads working for the NHS. They also introduced me to teams working in the R & D, who are involved in tracking and managing medical trials. Today some of the tasks that I was involved in included working with spreadsheets and using a new web based database called Edge. For the remainder of my work experience, I will be working as a team member updating projects and tracking projects, my work day starting at 9am and finishing at 4pm. Danielle: Today I went to Union House as it was my first day of my placement. My placement day will consist of starting at 9am and finishing at 5pm. Here I met with Anna who showed me around the workplace and then she introduced me to some of the people I will be working with over the next two weeks. SOme of the tasks that I was given today included filling out parking permits for the people who will be issued them for their cars. There are three folders of them in Alphabetical order which cover the records from 2016 to 2018. I had to take the 2018 ones out and put them in new folders. 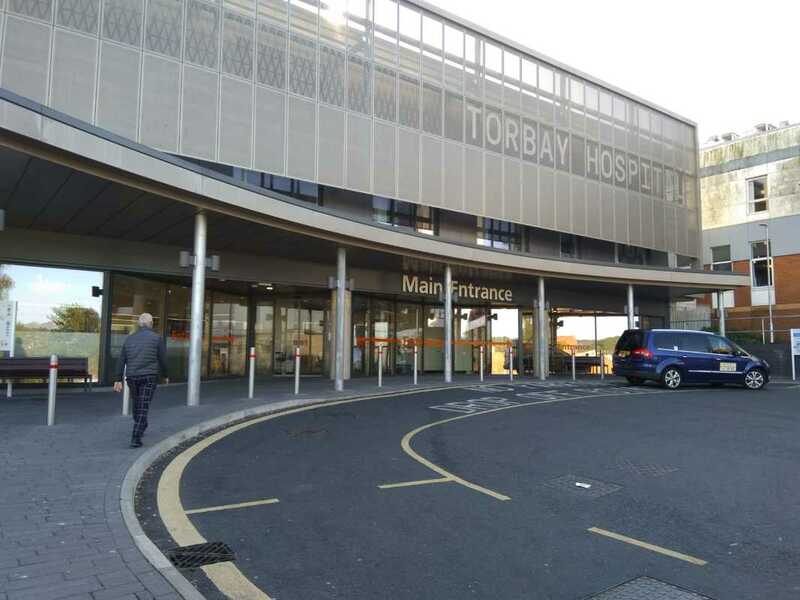 Kevin: It was my first day of placement here in Devon and today I met Ian Armstrong who is over the business area of the catering sector of the hospital. He showed me the costing side of how the hospital is run and how they keep record of all their stock which proved to be very interesting. I was then given the task to update their prices on a spreadsheet and had to make word documents of different products listing the ingredients that causes allergies. Overall this was very interesting as it gave me an insight into the background of how the hospital is run on a day to day basis. 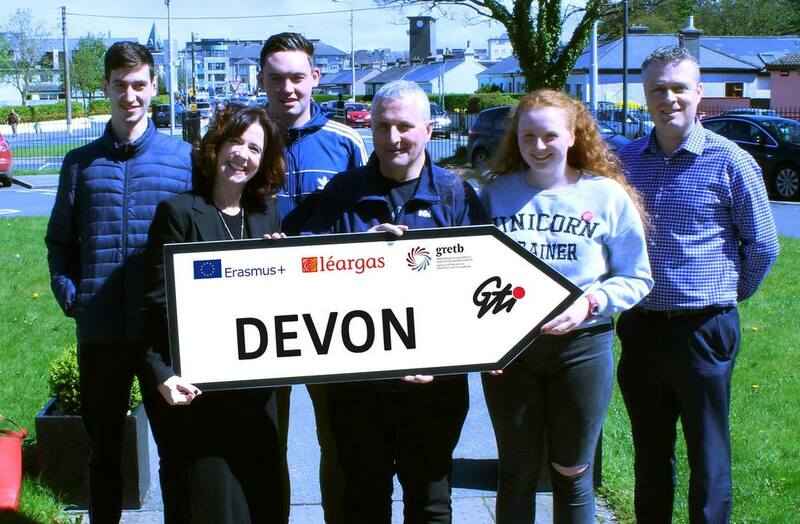 Today we visited South Devon college where we met Karen and the other students that came to GTI to complete their ErasmusPlus placements. Whilst there we had a coffee and a caught up with them and got an insight into the college and what courses they offer. Afterwards, the students gave us a tour of the college. The college has 9 campus`s, with approx 9000 students and 1200 staff overall. We then attended an economics lecture for 2 hours and a creative promotion for an hour and learned the structure of the class room and how their education system works. Getting to know the buses was a bit of a challenge but we figured it out in the end. We plan to start work experience tomorrow at 9 o clock. We arrived in Devon on Saturday and settled in to what will be our new home for the next two weeks. Our hosts for the next two weeks will be the South Devon College. We are all looking forward to meeting with our hosts and also the students that completed their placements in Galway. This morning we arranged with one of the students from South Devon College (who came to Galway on their ErasmusPlus placement) to bring us to the Paignton zoo. It was good to have someone who knew the area, to show us around and give us a better idea of the place. We’re all now familiar with the town and have arranged to get the bus to South Devon College tomorrow morning for our induction and first day of work which we are all looking forward to.